Cautiously, my husband Gary, our friend Michael, and I followed a nearly invisible path through the fog and up the side of Loughcrew hill, just before sunrise. A huge crow—perhaps a raven—flew by, its wings flapping loudly in semi-darkness. 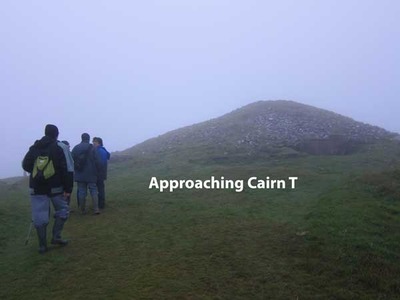 We were heading to the ridge top to see a twice-a-year spectacle: the rays of the equinox sunrise penetrating the passageway of Cairn T, a 5,500-year-old megalithic tomb situated 52 miles northwest of Dublin. The equinoxes, which occur around March 21 and September 21, are the two times of year when the days and nights are of equal length. Distant drumming drifted through the swirling mist, along with the faint sound of voices. Others had reached the site before us. Soon we arrived at the top. A large mound of mist-sparkled green grass and rocks, Cairn T looked like an immense, squat mushroom, partly encircled with huge kerbstones. A number of ruined, exposed stone chambers and tumbled stones were scattered over the hillside. Clumps of people milled around, seeking shelter, chanting, or sharing mugs of steaming coffee and pieces of cake. The event had the mixed flavor of a class reunion and a revival meeting. Even photos of the Cave of the Cats gave me the willies. I wasn’t going to enter it, not if you paid me. I was sure of that. My companions could go in if they wanted, but not me. We sloshed through the wet field to the entrance, a dark inverted triangle almost hidden by an overgrown thorn bush. A gash, a hole in Mother Earth. “No way,” I muttered, shaking my head. Jack, flashlight in hand, offered to go in first, and I watched him slither into the tight-fitting slit. County Roscommon in western Ireland has a reputation for being boring, but it is anything but. The Rathcroghan complex has been a powerful place since the Neolithic, roughly 6000 years ago. It is an enigmatic landscape shrouded in myth, the burial place of long-forgotten heroes and the kings and queens of Connacht. It is one of the legendary “Celtic Royal Sites” of Ireland, ranking with the better-known Hill of Tara. Like Tara, Rathcroghan unites legend with history. 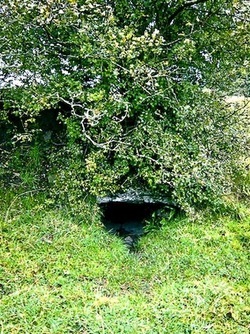 It includes over 200 sites: ancient earthworks, tumuli, ceremonial avenues, ring forts, standing stones, the remains of a Druid school, holy wells, and caves. We’d come for the caves—one in particular, the Cave of the Cats. Oweynagat (pronounced “Oween-ne-gat” or “UUvnaGOTCH”) or the Cave of the Cats is a spooky place, filled with powerful energies both of the earth and of the Otherworld. The Morrigan, Celtic goddess of death, destruction, and passion, is said to reside within. I was offered a sweet little gig to come to Ireland for two weeks and blog about my travels. I was set up with fabulous rooms in fabulous hotels across the country and then my job was to wander about, find a story, take some photos, then come back and post once or twice a day.